Robert Matano, the AFC Leopards coach sprung from his technical area, sprinted all the way to the far left corner of the pitch as he celebrated Vincent Oburu’s second half goal, one that all but wrapped up Ingwe’s red letter day. That, for a man who casually stands, lifts both fists high, even without a smile celebrating a goal showed just how much it meant to him. Still clutching his umbrealla in hand due to the heavy rains, Matano embraced each of his players after the final whistle, smiling widely to his last teeth. 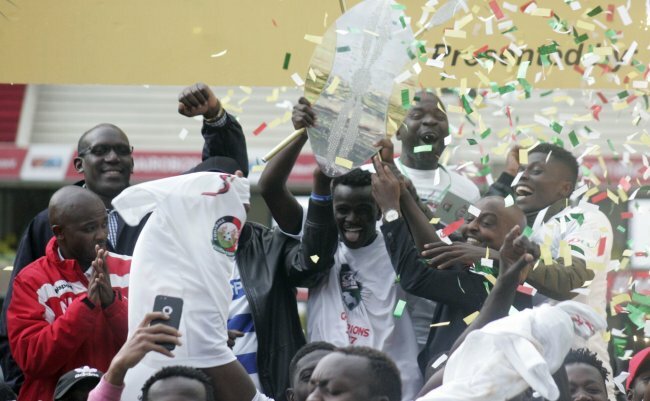 AFC Leopards made up for their struggling season by beating Kariobangi Sharks 2-0 at the Moi Sports Centre Kasarani to lift this year’s GOtv Shield title. Apart from the Sh2m cash prize, AFC Leopards will now represent the country in next year’s CAF Confederations Cup. The experienced tactician came inches close to winning the crown last season while with Ulinzi Stars, but the soldiers lost by a solitary goal to Tusker FC. Matano bemoaned the loss, especially coming after he had missed coaching the side for three months prior to the final due to illness. Friday evening was a crowning moment for him and for a man of few words, Matano was acres over the moon after referee Peter Waweru’s final whistle. “I am really pleased. I have been telling them for the whole week that this is their chance to redeem themselves and they came in here and did the job. I am proud of the players because of the output they have given. We played like winners,” Matano told Sports News Arena after the match. Oburu’s goal eight minutes from time added on to Salim Abdallah’s 18th minute opener as AFC Leopards picked their 10th domestic cup title, one they last won in 2013. William Muluya, the Kariobangi Sharks coach was gracious in defeat, praising his players for a good fight in their first ever major final. “This was a game of chances. AFC Leopards took their while we didn’t. We fought really well but at the end of the day, things didn’t turn out well for us. Conceding early was a huge blow for us because we also took time to recover from that. Abdallah broke the deadlock with a thumping header after rising highest in the box to meet a corner from Duncan Otieno. AFC Leopards had started better and were duly rewarded for their resilience. Before the goal, they had other decent opportunities to score. In the fourth minute, Whyvonne Isuza sent Ray Omondi through on goal one on one with John Oyemba, but the striker took too much time with the ball, defender Geoffrey Shiveka racing back to make a superb tackle. In the eighth minute, the ball fell kindly on Musa Mudde after John Oyemba’s weak punch from an Isuza cross, but the Ugandan midfielder’s aim to lob the ball into an empty net was awry. Aziz Okaka also had an opportunity in the 14th minute with a shot from the edge of the box which flew wide. After going one down though, Kariobangi Sharks turned the pressure on Ingwe and in the 25th minute, Mathew Tayo threatened with a curling effort inside the box which went wide with Gabriel Andika at full stretch. Five minutes later, Kariobangi Sharks had penalty shouts drowned after Massoud Juma appeared to have been clipped by Andika while lobbying the ball over him but the ref waved play on. It was a difficult day in office for Juma as he had been closely marked by AFC Leopards defender Abdallah. Every time the forward had the ball, he was confronted by at least two AFC Leopards defenders, Abdallah always one of them. It was Ingwe’s strategy to ensure the deadly forward was starved off the ball, knowing only too well he had the ability to single handedly decide the game. Five minutes from the break, Juma managed to shake himself off Abdallah from a corner, but his header brushed off the defender for a corner. The start of the second half had six minute delay after a scuffle between AFC Leopards and Football Kenya Federation stewards. Ingwe stewards had engaged one of the Kariobangi Sharks technical bench members in a fight behind the AFC Leopards goal, prompting the FKF stewards to intervene. Calm was restored and action shifted back to the pitch. Muluya made a tactical switch, pulling out defender Paul Kamau for winger Ovellah Ochieng while Duke Abuya came off for Ebrimah Sanneh, a clear attacking intent. It was a shift in tactics by the tactician as he went with three at the back, playing with five midfielders while Sanneh joined Juma upfront for a two-man attack. But again, it was AFC Leopards who had a chance to score when Oburu picked the ball unmarked on the left but his eventual was weak, Oyemba making an easy catch. Not even the torrential rains that pounded Kasarani could reduce the momentum of the game. Ovellah Ochieng saw his well curved freekick from the left come off the upright while Juma had two shots fly wide. Matano seeing his side hugely pushed back pulled out Ray Omondi for Alex Kitenge in a bid to beef up the attack. Muluya’s men piled the pressure but they were undone eight minutes from time when Oburu slammed the ball into the net after Oyemba’s save from an Okaka shot from the right fell kindly on his path. With eight minutes remaining and nine added on, AFC Leopards were disciplined in defense, guarding their lines well to ensure they kept their clean sheet and two goal advantage. AFC Leopards: Gabriel Andika, Dennis Sikhayi, Lewis Wanami, Duncan Otieno, Salim Abdallah, Victor Majid, Aziz Okaka, Whyvonne Isuza (Michael Kibwage), Ray Omondi (Alex Kitenge), Musa Mudde, Vincent Oburu. Unused subs: Ian Otieno, Ramadhan Yakubu, Samwel Ndung'u, Harun Nyakha, Andrew Tololwa. Unused subs: Robert Mboya, Francis Manoah, Christopher Kimathi, Calvin Odongo.